Description: The intent of the pocket park design is to expand upon the existing triangular green park and strengthen the space as a highly usable pocket park. The new metro line, while its extremely beneficial in terms of transit, creates a dark unappealing space below. The main concept in creating the new pocket park is to mediate the size of the large concrete columns with raising grade to create undulating earth mounds. These mounds will form the framework for the park and will be multi-functional. They will serve as barriers from the arterial roads Washington and National, they will bring down the scale of the 20’ concrete bridge, and lastly they will serve as a playful gesture in the park for children to play on. The new park will remove ~95% of permeable paving and replace it with a more sustainable pervious groundplane consisting of synthetic turf and decomposed granite. The synthetic turf will be used as the design team is conscious of the water requirements and carbon footprint imposed by maintenance vehicles. 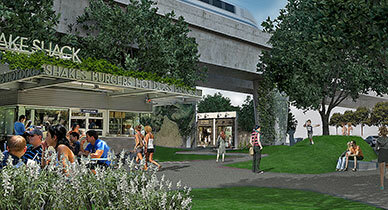 Shade trees will be strategically placed and adequate seating will be arranged near childrens play areas for supervision. There is a unique opportunity for an installation of local art at the pocket park as the earth mounds set a black canvas for something to rise from within them. An iconic art piece also will create an opportunity for the light rail users to have a recognizable element to reference and will hopefully be curious to get off the metro line across the street and come see.